Why can't I post pictures????? I have been trying to post some new pictures of my latest knitting project and for some reason blogger won't let me. Where you usually have a button to click on that allows you to go into your drive to upload photos, it is missing. Does anyone else have this problem, or is it only me?? The baby Cooper got a sweater and hat photo shoot today. I had knit this over the summer while we were on vacation and thought I would try it on him. It's a bit big since I made it thinking he would grow into it. He's only about 3 lbs now and I expect him to grow to about 6-8?? Anyway, the sweater didn't seem to bother him since I have a smaller one I made that he has grown used to me putting on him. It's the hat that freaked him out. So, I think it's all for fun and it won't be a regular thing he will be wearing this winter. That's o.k., because we had a lot of fun seeing him in it and hopefully he will wear it when it's really cold outside and he wants it on! Hi there! Cooper got a new bed for a gift from my friend Deb. He fell asleep in it while wrestling with his lobster buddy. Too cute. I have been knitting up a storm with a new bag pattern I found on knitty.com. It came out so cute, I started a new one with fall colors that I had in my stash. Pictures to follow. Hi there! We had a wonderful weekend of soccer games and football games. Now I am staring at a mountain of laundry to do and my children want to go to the mall. Happy to have a day off from school and not get up at the crack of dawn. So, the laundry has to wait and I plan to have fun with my kids. Hi there! 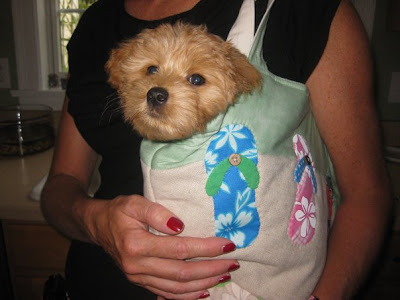 Well, I have a cute little "purse puppy" I wanted to share with you. Cooper is 9 weeks old and my little buddy. (He's sleeping on my lap while I am blogging here!) This bag I have him in for the picture was maded my my friend, Takako. She lives in Japan and is SO TALENTED. To see her blog go to the blog scroll bar on my blog and click on "Takako's blog." (But just be aware you will only understand it if you read Japanese. Otherwise, the pictures are beautiful of what she makes!) She makes beautiful bags and this one just so happens to fit my little Cooper! We went to the store and everyone thought he was a webkinz. He is almost 3 lbs now. Since we got him he's gotten a little chubby. Treats for going potty outside can fatten up a boy! What a love and I just can't be happier with him. On the knitting front. I am in the middle of a great bag. (Pictures to follow another day.) It's a pattern I got from http://www.knitty.com/ and it's called "A little slip of a thing." Great pattern and an great looking bag so far. I'll post a pic or two when I can take some today or tomorrow. Thank you Takako for my bag last year. Little did you know it would fit my new puppy. You are a great friend and I love all of the wonderful things you make me! We did it! We are officially dog owners. I never thought it would happen, since I am a bit afraid of big dogs, but if you saw our sweet guy (all 2 pounds of him!) you would see how great he is. 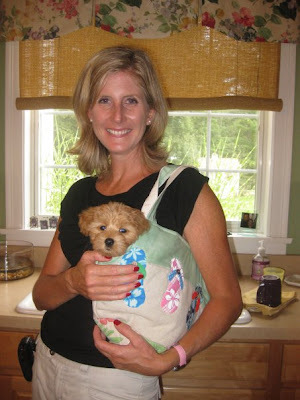 We bought him from a wonderful breeder in Connecticut who specializes in Maltipoo puppies. Her website is www.maltesecountry.com. Our baby boy's name is Cooper and he is fabulous. He's smart and easy going. Playful, yet so calm. I couldn't ask for a better dog. If you have a hankering for a puppy, give Gia a call at the Maltese Country number. She just had a new litter of Maltipoos and they are ready to take home in October. 7 days and counting! We have been anxiously awaiting our little sweetie and now we are down to days. 7 to be exact. OMG (as my kids would put it.) He is with his mommy and siblings for now, but our house is busting with doggie beds, a leash, chew toys and very anxious children. A big adjustment for me, but I can't wait. I need a little fluffball to keep me company when my babies are at school. Knitting and cuddling with that cute guy. What could be better?? I'm a Mom who loves to knit in my spare time... Did I mention I barely have any time to myself?? This is a Flickr badge showing public photos from ya-yaknits. Make your own badge here.